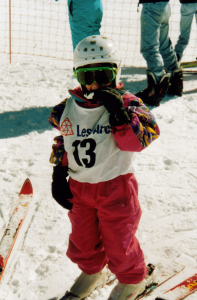 Born on January 29, 1990 in Bourg-Saint-Maurice, Marielle starts skiing at about 15 months. Her dad, ski instructor, guides her first turns. She joins the Les Arcs Ski Team and competes at her first race at the age of 8. She wins the Coq d’Or in 2001 and the Scarafiotti in 2005. She continues her schooling as a student athlete at the Lycée d’Albertville and obtain her high school diploma specialized in sciences with distinctions. In 2007, Marielle joins the ranks of the French National Alpine Ski Team with the junior group and she races on the European Cup circuit. It is in 2011 that Marielle has the opportunity to switch discipline and become a member of the French National Ski Cross Team. New Olympic discipline since 2010, Skicross is a race of about 1 minute and 30 seconds. The course in composed of jumps, rollers, banks, step-ups and others features where 4 ski racers confront each other’s simultaneously. The goal is to reach the finish line the quickest possible, the first two are qualified and can advance to the next round. At the end, the final determines the ranks of the top four from the order of arrival. As soon as her first season, Marielle obtains the 8th place of the World Cup overall ranking and a 4th place at the Winter X-Games in Aspen, CO. Her determination and constant progression, make her obtain the 3rd place of the World Cup overall for her second season. The third winter is less favorable for Marielle, not a single World Cup podium for her, but she is qualified to attend her first Olympic Games in Sotchi in February 2014. Seasons 2014/2015 and 2015/2016 were marked by two major injuries. In December 2014 in Val Thorens, a crash breaks two of her vertebrae. In February 2016, while training on the futur Olympic slope in South Korea, a bad landing is breaking her foot at multiple places, leading to a surgery on site. After two months of immobilization , is starting a long work of re-education, then a second surgery in September to remove a painful screw in the ankle. Marielle proves her will and get back on tracks with good feelings as soon as the first trainings of the season start. The lack of preparation does not allow her to take the start of the first two World Cup races. But Marielle makes her come back in Austria with a fabulous 2nd place. Out of 9 races, Marielle steps on the podium 3 times.